Welcome to Global Mitochondrial Disease Awareness Week, 2017! Every year, the mitochondrial disease community comes together in September to spread the word about this neuromuscular disorder. Mitochondrial disease is a chronic, progressive disorder that occurs when the mitochondria of the cell cannot produce enough energy for cell or organ function. Estimates suggest that 1 in 4,000 people will face a diagnosis of mitochondrial disease. Mitochondrial disease symptoms differ from person to person and can first appear in infants, children, teens, or adults. Common symptoms include poor growth, loss of muscle coordination, muscle weakness and pain, seizures, vision and/or hearing loss, gastrointestinal issues, learning disabilities, and heart, liver, or kidney failure. Mitochondrial disease symptoms affect many different organ systems. The neurologic, digestive, musculoskeletal, and cardiovascular systems are most commonly affected. Mitochondrial disease is related to autism, diabetes, Alzheimer’s, and Parkinson’s. You can learn more about mitochondrial disease here and here. There are tons of activities this week, including walks, Light Up for Mito, and Stay in Bed Day. I am hoping to post a gallery of Light Up For Mito once the event is over, so check back! (You can follow the hashtag on Twitter as well.) A partial list of international activities can be found here. By passing this blog post on to other people, you are helping spread the word about a serious but poorly-known disease that millions of us live with every day. So please, post a link to Twitter, Facebook or other social media to do your part in raising awareness of this deadly condition! 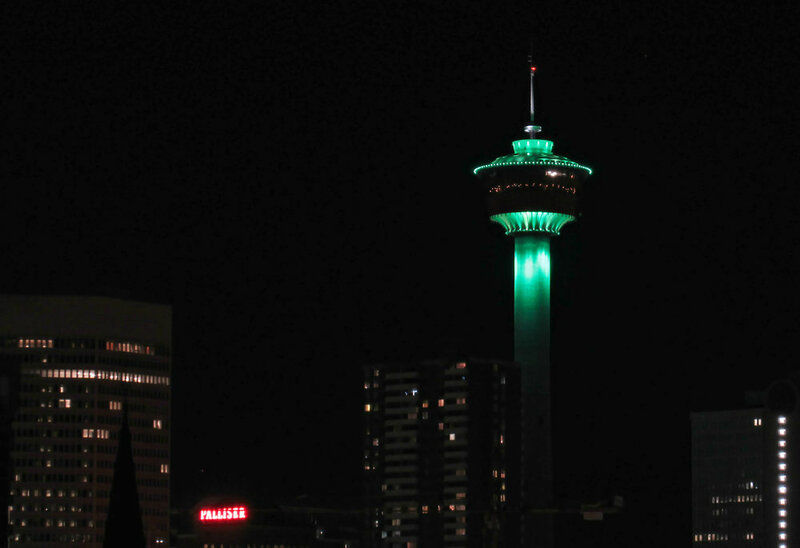 The Calgary Tower lit for mito awareness in 2016. Sadly, I no longer have a clear view of the Tower from my rooftop. Yes, it is that time again! Mitochondrial Disease Awareness Week runs from today (September 18th) to Saturday, September 24th. A whole seven days to get the word out about a little-known neuromuscular disorder that involves dysfunction of mitochondria, aka the powerhouse of the cell. People with mitochondrial disease (such as myself) experience a wide range of symptoms across many syndromes, including muscle weakness, deafness, cardiomyopathy and mental disabilities. Events are being held around the world, and everyone is encouraged to participate - some ideas can be found here, & here. Or join a support group to get more involved with people affected my "mito" - there are many chat groups on Facebook, for example. I will be tweeting awareness all week, using the hashtag #MitoAwarenessWeek. Please take a few minutes to read and share information about mitochondrial disease! Yes, it is already time for Mitochondrial Disease Awareness Week! an internationally recognized week for educating and raising awareness about mitochondrial diseases. Mitochondrial diseases are a diverse group of ailments caused by problems with mitochondria - your body's biggest creators of energy. While some people are mildly affected and may only have a few symptoms, others can die from the exact same genetic defect. Even people in the same family can have wildly varying experiences of "mito". For more basic information, check out Mito Action's FAQ here. Mito Action also has a great page with resources & ideas for spreading awareness this week; definitely worth checking out! For more ideas and info, please see the United Mitochondrial Disease Foundation page for awareness week. Please pass this post on! For every mitochondrial disease patient - past, present & future - please click the banner below or here for more info about Mitochondrial Disease Awareness Week for 2014. Participating in one of the listed activities is a great way to get the word out about this disease. Hadn't heard of mitochondrial disease before now? You can learn more on MitoAction's website. Do what you can to spread the word, bringing us closer to better treatments & support!